Clockwise around the circle, from bottom left: Josephine, Sandy P., Kristina, Sandy B., Irena, Asta, Joanie, Mary, Sharon and Teresa. The store’s proprietor obliged with a few smartphone photos of our group, to which I remarked that no flash would be required due to such an excess of blonde hair. 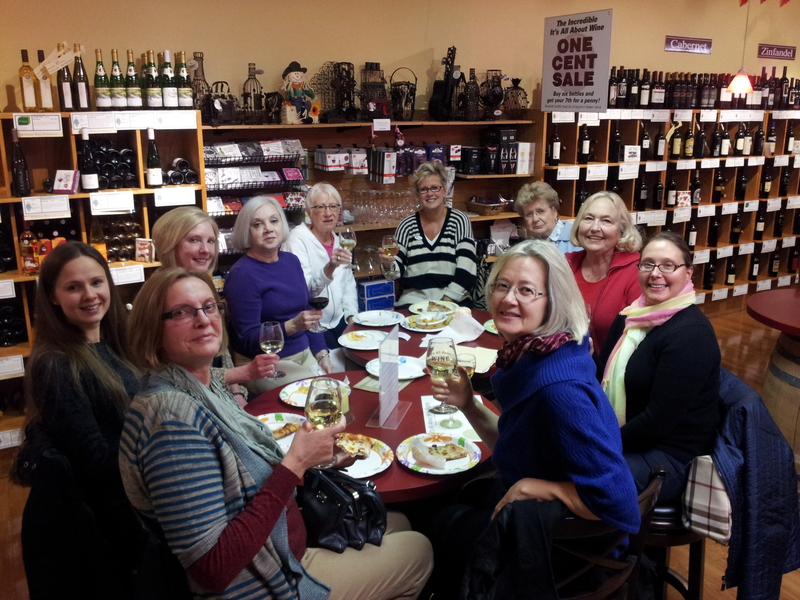 Clockwise from bottom left: Irena, Asta, Joanie, Mary, Sharon, Teresa, Josephine, Sandy P., Kristina, and Sandy B.
Mary M. brought a hummus dip to go with our wine, and also the plates and napkins necessary to divvy up and devour a pizza. 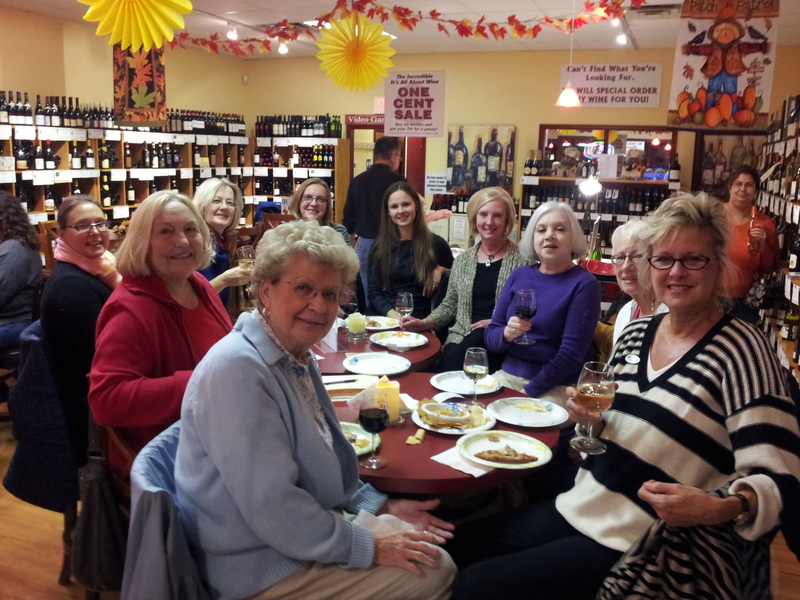 Our upcoming Lithuanian-American Club Christmas Party on Dec. 6 was mentioned, as well as a possible Nov. 22 caravan to Grand Duke’s Restaurant and Racine Bakery in Chicago. My favorite part of the evening, other than introducing my long-lost Orback cousin, revolved around a hand-written music book belonging to coal-mining immigrant Leonard Naumovich, Sr., whose granddaughters Joanie and Mary were present. Grandfather and great-grandfather to the city’s large Naumovich clan, Len, Sr. died in 1934. When two of our “Third Wave” Lithuanian immigrants, Asta and Irena, graciously did an on-demand translation of some of Len, Sr.’s handwriting, we made an exciting discovery. We learned that Len was not only literate and educated, but that he was also a fan of Maironis (1862-1932), the leading poet of Lithuania’s national revival after hundreds of years under the Polish or Russian heel. This daring late-19th Century renaissance of the Lithuanian language and national consciousness, while Lithuania was still under the rule of the Russian Czar, coincided with Len’s own life and times. And he apparently remained a part of it even after immigrating to the U.S.
Len’s fragile 100-year-old music book is also an inspiring testament to the spirit of music and poetry that lived on in the heart of a poor coal miner with no opportunity for the life he would have chosen to live, if he had had a choice other than mining coal. 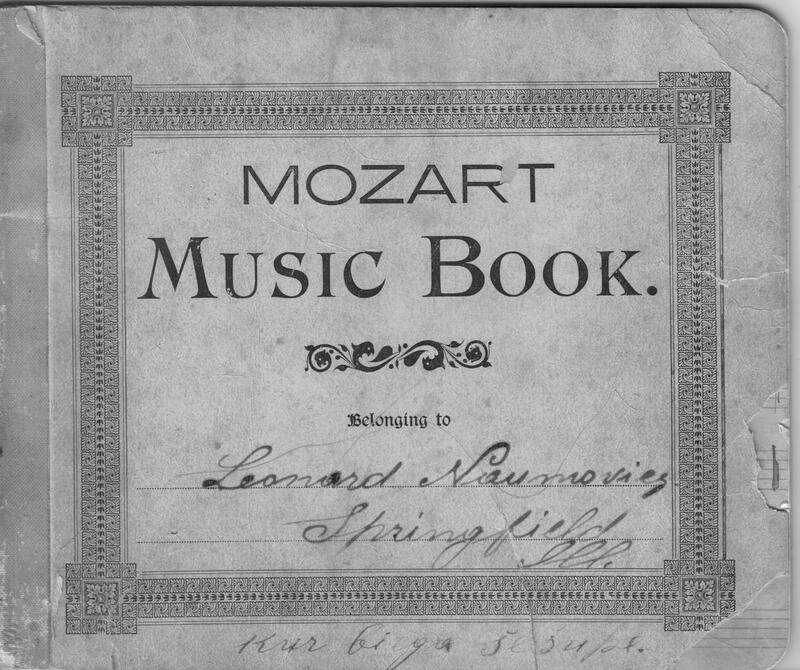 The cover of Leonard, Sr.’s hand-inked music book. See words at the very bottom. Tai mūsų tėvynė, graži Lietuva: That’s our fatherland, beautiful Lithuania. 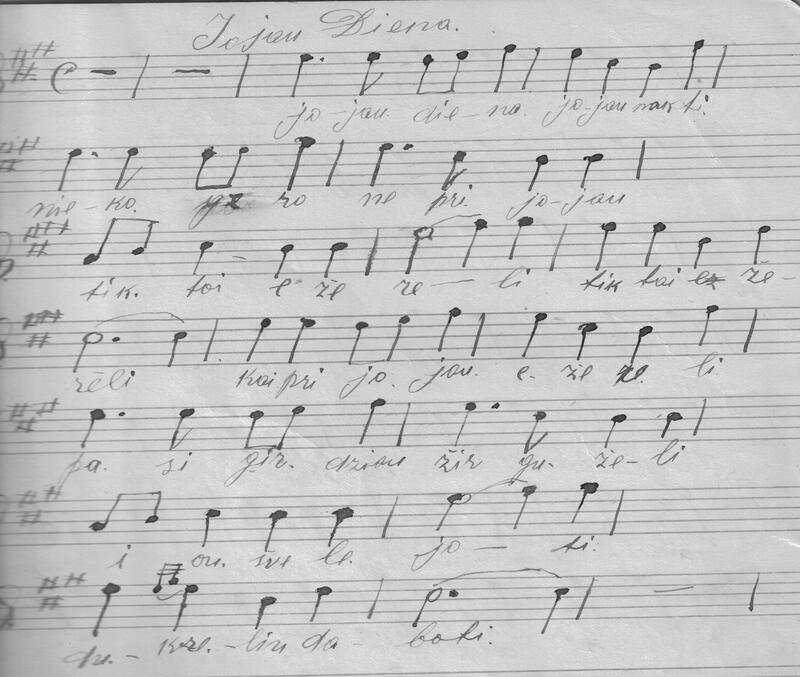 “Jojau Diena” — “Riding Day.” The poetry of Maironis united lyrical visions of the Lithuanian countryside with folk music. Thank you, Sandy, for organizing such a nice gathering. Very nice. Sorry to have missed the get-together this time. Sandy, thanks for sharing your blog with me. Translating from and seeing the 100 year old music book written by Mr. Naumovich and now in the possession of his granddaughters gives me chills. What incredible stories as your blog continues to tell of their strong desire to survive, to be brave, to adapt, to suffer so much yet rise above and make a new life.